Ocimum basilicum is native to tropical Asia. 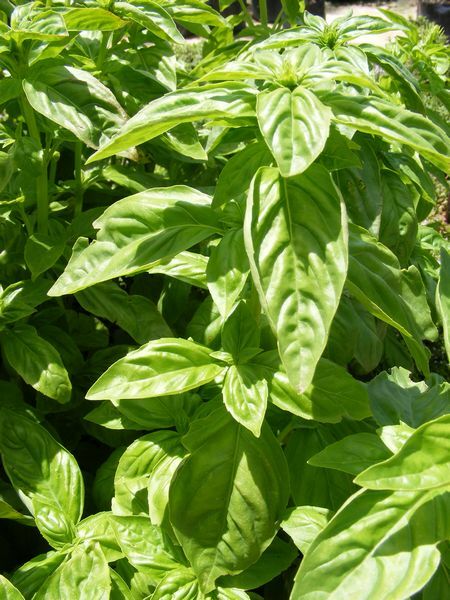 It is an erect, much-branched aromatic plant, woody at the base and with bright green leaves. Small, white tubular flowers are borne in whorls, to 2cm apart. Needs rich, light well-drained to dry soil pH5-8, in sun. Pinch our growing tips to encourage bushiness and delay flowering. Tomato, pasta, soup, salads and vegetables. Whole plant. Leaves, flowers, seeds. Treat bacterial infection and intestinal parasites.